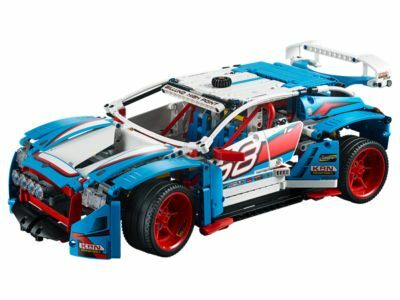 Enter the world of rally driving with this impressive LEGO® Technic Rally Car model, featuring sporty blue, white, red and black bodywork with cool racing stickers, rear spoiler, 4 spot lamps and large 6-spoke red rims with low-profile, road-gripping tires. Open the doors to access the detailed cockpit complete with racing seats and a red roll cage. Lift the hood and you'll discover the 2-fan engine cooling system, while under the rear hatch you'll find a detailed V6 engine with moving pistons. This awesome vehicle also features working steering and robust suspension. When you feel like another building challenge, rebuild it into a high-speed Buggy. Price is 32% below the initial Lego retail price, a € 32.39 discount! This comes down to 6.73 cent per brick. The Rally Car (42077) Lego set is available from the sites below. However, they do not offer delivery to your selected region. The Rally Car (42077) Lego set is no longer directly available from the sites below. However, 3rd party partners of these sites might still have the set available. Alternate description Push the limits with the awesome LEGO® Technic Rally Car! Features working steering and suspension, large rear spoiler, 6-spoke red rims with low-profile tires, detailed grill, opening hood, 2-fan engine cooling system, opening rear hatch, V6 engine with moving pistons and a well-equipped cockpit with opening doors, racing seats and roll cage. Check out the sporty blue, white, red and black bodywork with rally stickers. Open the doors to access the detailed cockpit with racing seats and roll cage. Check out the tough suspension and working steering. 2-in-1 model: rebuilds into a Buggy. Rally Car measures over 9” (24cm) high, 16” (42cm) long and 8” (21cm) wide. Buggy measures over 6” (16cm) high, 14” (36cm) long and 8” (22cm) wide.